Modern cold storage and sophisticated cold chain warehouses have revolutionized the process of food storage and seasoning which catalyses the growth in seafood and other industries. Thanks to the thermodynamic cycles and chemical properties of refrigerants like Ammonia and Freon. Even after having many advantages, the industry is suffering from the high cost due to installation, maintenance and effective monitoring of multiple compressor systems, which are the heart of refrigeration. Does critical temperature control and unpredictable machine trips affects your business? Does High energy consumption and unpredictable utilization of resources decelerate your long term business goals ? We have the optimum solution to utilize your assets at its maximum efficiency and reliability. 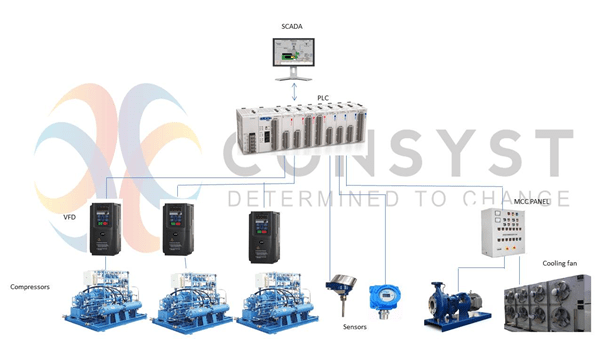 The SCADA based solution offered by CONSYST is a highly efficient process monitoring and compressor management solution for Cold Storage. Traditional ON-OFF control of compressors results in poor temperature set point maintenance and affect the life of compressor. The temperature switches between two hunting points and affect the product quality. The frequent start-up of machine results in huge energy consumption and affects the life of machine bearings. Unpredictable machine trips and maintenance duration affects the product quality and preservation standards which in turns affects the profit and business credibility. Inefficient defrosting affect the total cooling capacity of entire refrigeration system. Evaporator coils must be free of ice to maximize heat transfer. Manual defrosting has many disadvantages. Improper start-up and integration of auxiliary pumps and fans like oil pump, cooling water pumps, evaporator fans heat-exchanger accessories will greatly affects the compressor safety and total refrigeration cycle efficiency. Unwanted working of these pumps and fans will shoot up your energy consumption. Traditional compressor control system provides some indications of your motor on/off status. The information is not sufficient for the operation of your cold storage. During door opening and transportation, Cold storage temperature changes drastically Traditional compressor control can’t respond to such drastic changes immediately. Suction temperature has an effect on compressor efficiency. Compressor power drops 2% – 3% for each degree F of temperature rise. Traditional systems do not account for the same. Leakage of refrigeration fluid cost your manpower safety. Ammonia is highly toxic which leads to breathing problems. Since these toxic fluids have an environmental and health issue you must be extremely conscious in start up safety lines. This requires the support of a robust process interlock and safety philosophy. For any control system you must tune it for the bump less control of parameters. Here also you need to adjust the thermal expansion valve for optimum performance. The above strategic and operational issues can be overcome by our modern industrial PLC – SCADA solution which monitor and analyse your machine performance and requirement. Traditional temperature sensing and on/off control mechanism is an inefficient method to control your storage temperature. For maintaining a smooth and steady temperature, we need to adopt suction pressure based PID control algorithm. The suction pressure of the evaporator chamber is the direct indication of your temperature demand. The PID output then controls the machine speed through a variable frequency drive, thus controlling your compressor according to temperature demand. The PID controller is capable enough to immediately adjust your machine speed during rapid fluctuations result from door opening and material handling. The prime advantage is to decrease your electricity consumption. The frequent start stop action of the machine affects its life, by decreasing bearing durability, Which in turn result in frequent maintenance activities. The unexpected machine trips are another problem which affects the smooth operation of refrigeration system. To avoid this and forecast periodic maintenance, our system checks oil pressure, winding temperature of the motor, Oil separator status and overall machine vibration. The plant personnel can monitor these parameters live through the SCADA System and analyse the machine life and schedule your periodic maintenance without affecting your business. A dedicated start up philosophy and interlock mechanism is necessary for ensuring safety of your unit. Our PLC system provide interlocks and monitor the following auxiliary system. Proper and timely defrosting is another factor which determines heat transfer capacity of the system. Our new system provides a temperature sensor based defrosting thus overcomes the limitations of fixed time based manual defrosting. The SCADA screen also indicates the defrosting mode and temperature. Multiple compressor management and effective load sharing is the main attraction of our SCADA Solution. Large cold storages simultaneously operate multiple compressors and maintain stand by compressors. Our dedicated algorithm controls individual compressor speed according to the load demand. Our system combines effective combination of different rated compressors to make the system energy efficient and operationally efficient. It is also possible to integrate refrigerant leak detection sensors as an added safety factor. The SCADA System provide details about Individual compressor running hours, load status of each compressors and motor kilowatt status. It also provides graphical data of your daily, weekly and monthly electricity consumption. It is possible to calculate and infer the electricity bill details. It provides SMS alert during critical alarms. Speed control of compressors according to temperature demand improves energy efficiency and machine life. Multiple compressor management system allows optimum utilization of machines through load sharing and speed control. The machine monitoring parameters allows you to avoid unexpected trips and planned maintenance. Auxiliary pumps and fan interlock increases safety and performance. Graphical representation of entire system and monitoring of critical parameters. Effective heat transfer by sensor based defrosting. SMS Alert during critical alarms points. Fine tuning of the system to attain optimum operating condition.